SINCE FEW MONTHS THIS IS OUR FAVOURITE DISH – WE EAT SHAKSHOUKA FOR, BREAKFAST, LUNCH, DINNER… THE POZNAN-BASED RESTAURANTS ARE ALSO IN LOVE WITH THIS TUNISIAN PLATE – IT’S SOOO TASTY, WITH EGGS, SPICES, TOMATOES & OTHERS. WHERE YOU CAN FIND THE BEST SHAKSHOUKA IN THE CITY? WE GOT 5 PLACES FOR YOU – CHECK THIS OUT! In fact, these are eggs cooked in slightly spiced tomato sauce. The name of the dish literally means “mess”, so it perfectly defines what we will find in the pan! In addition to the mandatory ingredients – eggs and tomato sauce, shakshouka can be varnished by any additives. Cheeses, meats, meats, herbs… There are no bad choices here! Shakshouka originates from Tunisia, but other sources point to its Egyptian, Israeli and Moroccan roots. It’s one of the first places that introduced a famous tomato dish in its menu. 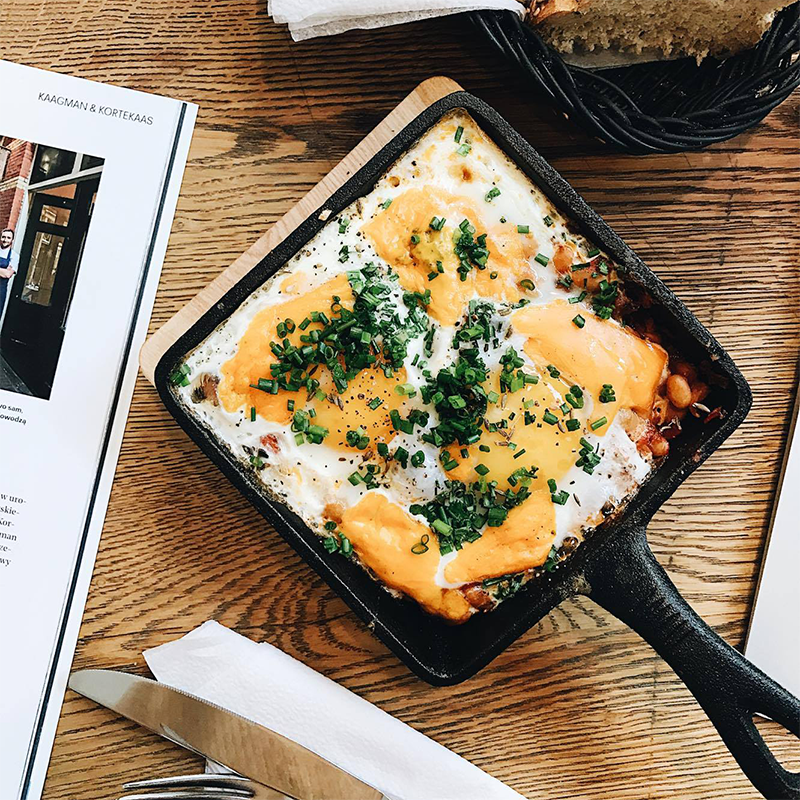 Despite the Scandinavian influences, the owner of Lars decided to diversify the breakfast offer, making shakshouka in 2 version: with feta cheese, onion, chillies, honey and herbs and with chorizo (24 PLN / 29 PLN). This is a result of distant travel and Middle Eastern inspiration! The dish is served here with homemade bread, which we absolutely love. Breakfast offer is valid until 12:00 – go check it for yourself! Our beloved pub on Jeżyce convinced us that the shakshouka is also a great option for lunch! For 18 PLN you will try here eggs in an aromatic paste of paprika and tomatoes with the addition of labneh cheese (it is defatted Greek yogurt) and vegetables. Also famous pita, rose jallab drink and you can really feel the Middle East atmosphere! Interestingly, FALLA sometimes organizes thematic weeks with crazy versions of shakshoukas – unusual taste is absolutely guaranteed! We love this bakery/bistro from the day they opened up. Shakshouka served here (17 PLN) is probably the biggest portion we had the opportunity to try! On a huge frying pan you will find vegetables and ricotta cheese – it’s so big, that we totally recommend this dish for lunch. Option for real fit lovers! If you take care of what’s on your plate and you like counting calories, you’ve come to your magic place. Shakshouka served in Jaglana is one of our favs – we love aromatic spices, aesthetic look and the addition of our favorite avocado! Large plus also for the possibility of serving vegan and gluten-free bread, and all this for 18 PLN. Next day you have to start with a visit on Kramarska Street! Their cozy armchair by the window waits for you. The place, which has certainly revolutionized the eating of breakfast in our city, recently introduced into its menu a shakshouka! Here, unlike the previous cafes, it is served in a square pan with less tomato sauce, and with the addition of white beans and chives. Great plus for smooth yolks, tasty connections, and the price – for 12 PLN you will get a full course + homemade bread and any drink you want. Would you like to see our recipe for shakshouka? Let us know in the comments. And also follow us FB i Instagram, and tag your foodie travels inspired by our favs places – #mytujemy. Let us find you!